Standard German originated not as a traditional dialect of a specific region, but as a written language, developed over a process of several hundred years, in which writers tried to write in a way that was understood in the largest area. Until about 1800, Standard German was almost entirely a written language. In this time, people in Northern Germany who mainly spoke Low Saxon languages very different from Standard German learned it as a foreign language. 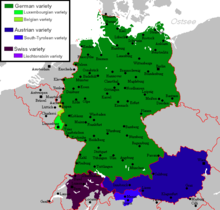 However, later the Northern pronunciation (of Standard German) was considered standard and spread southward; in some regions (such as around Hanover) the local dialect has completely died out with the exception of small communities of Low German speakers. It is thus the spread of Standard German as a language taught at school that defines the German Sprachraum, i.e. a political decision rather than a direct consequence of dialect geography, allowing areas with dialects of very limited mutual comprehensibility to participate in the same cultural sphere. Currently, local dialects are used mainly in informal situations or at home and also in dialect literature, and more recently a resurgence of German dialects has appeared in mass media. In German, Standard German is often called Hochdeutsch, a somewhat misleading term since it conflicts with the linguistic term High German. High German of the southern uplands and the Alps (including Austria, Switzerland, Liechtenstein and parts of northern Italy as well as southern Germany) contrasts with Low German spoken in the lowlands stretching towards the North Sea. To avoid this confusion, some refer to Standard German as Standarddeutsch ("standard German"), deutsche Standardsprache ("German standard language"), or if the context of the German language is clear, simply Standardsprache ("standard language"). However, the word "standard" downgrades the linguistic position of the daily language spoken in Switzerland and Austria, and people there often prefer "Hochdeutsch" or "High German" as it is less aggressive towards Swiss Standard German and Austrian German. Standard German differs regionally. The most accepted distinction is between different national varieties of standard German: Austrian Standard German, German Standard German and Swiss Standard German. Additionally, there are linguists who posit that there are different varieties of standard German within Germany. Linguistic research of the different varieties of standard German began for the most part only in the 1990s, especially in Austria and Switzerland. During the existence of the German Democratic Republic, there were occasional studies about whether there were differences between the standard varieties of the German Democratic Republic and the Federal Republic. The German federal state of Bavaria has promoted language diversity in the past in an effort to preserve its distinct culture. In Northern Germany, there is no continuum in the strict sense between the local indigenous languages and dialects of Low German ("Plattdeutsch") on the one hand, and standard German on the other. Since the former have not undergone the High German consonant shift, they are too different from the standard for a continuum to emerge. High German and Low German can be considered to be separate languages because High, Middle, and Low German form a dialect continuum and Standard German serves as dachsprache for all forms of German, they are mostly seen as dialects of German. Under a socio-linguistic approach to the problem, even if Low German dialects are Abstandsprachen (linguistically quite different), they are dialects of German, because they lack Ausbau. However, Low German did influence the standard-based vernaculars spoken today in Northern Germany by language transfer (in pronunciation, vocabulary, grammar, and syntax), and it continues to do so to a limited degree. High German heavily influenced by Low German has been known as Missingsch, but most contemporary Northern Germans exhibit only an intermediate Low German substratum in their speech. While there is no officially recommended standard, and multiple regional variants are considered correct, there does exist a standardised accent which is generally used in radio and television as well as in German learning materials for non-natives, and to varying degrees by language teachers. This accent is documented in reference works such as Deutsches Aussprachewörterbuch (German Pronunciation Dictionary) by Eva-Maria Krech et al.,[note 2] Duden 6 Das Aussprachewörterbuch (Duden volume 6, The Pronunciation Dictionary) by Max Mangold and the training materials at the Westdeutscher Rundfunk (West German Broadcasting) and Deutschlandfunk (Radio Germany). It is an invented accent rather than radiating from any particular German-speaking city, but it is closest to the German spoken in Hanover. A first standardization, although non-prescriptive, of Early Modern High German was introduced by the Luther Bible of 1534. In consequence, the written language of the chancery of Saxony-Wittenberg rose in importance in the course of the 17th century, and the 1665 revision of the Zürich Bible abandoned its Alemannic-based idiom in favour of this standard. The First Orthographical Conference was called in 1876 by the government of Prussia. The 1996 spelling reform was based on an international agreement signed by the governments of the German-speaking countries Germany, Austria, Liechtenstein, and Switzerland; but acceptance of the reform was limited. While, as of 2004[update], most German print media followed the reform, some newspapers, such as Die Zeit, Neue Zürcher Zeitung and Süddeutsche Zeitung, created their own in-house orthographies. ^ Though about 10%, or 830,000 Swiss residents speak High German a.k.a. Standard German at home. ^ On pages 1-2, Deutsches Aussprachewörterbuch discusses die Standardaussprache, die Gegenstand dieses Wörterbuches ist (the standard pronunciation which is the topic of this dictionary). It also mentions Da sich das Deutsche zu einer plurizentrischen Sprache entwickelt hat, bildeten sich jeweils eigene Standardvarietäten (und damit Standardaussprachen) (German has developed into a pluricentric language separate standard varieties (and hence standard pronunciations)) but refers to the standards as regionale und soziolektale Varianten (regional and sociolectal variants). ^ Hammarström, Harald; Forkel, Robert; Haspelmath, Martin, eds. (2017). "German". Glottolog 3.0. Jena, Germany: Max Planck Institute for the Science of Human History.